Launch Storyboard not showing image when project builds to device. I setup a Launch Screen Storyboard which has a logo for my app in .pdf vector. When I build the project image is not visible on device. Simulator works just fine. Tried on a few diffrent devices and the issue persists. Cleaned the whole project, deleted derived data, still an issue. Image is getting pulled from Asset catalogue. Any ideas? Re: Launch Storyboard not showing image when project builds to device. Same here, UIImageView only appears on Simulator !! It seems to be definitely a bug, if you add Size Class Customization then remove them, the UIImageView appears again on device. I can confirm that this also happens to my project. I use a LaunchScreen.xib file that has a couple of images and the Logo image centered. If ran on a device, the Logo image's not loaded, all other images are loaded. If ran on the Simulator, it works properly. I even tried putting the image to a different UIImageView element in the app and the image renders without issues. Hopefully we can get an answer about this since it completely blocks a release on the App Store. A solution that worked for me: edit the image (with GIMP for example) and remove alpha channel from it. I don't know if this will help anyone. I was having the same problem. I had several images on my launch screen that stopped showing up. 2) Created a folder in Images.xcassets and put the images in there. 3) The images in the launchScreen.xib were originally called imageName.png. This was changed to just imageName (remove the file extension. After the third thing the images appeared. I don't know if either of the first two steps are required, but hopefully it will help someone. I had been experiencing similar issues for several hours. Then I thought about simply restarting the iPhone. Problem solved. There has to be some caching related problem. Restarting iPhone solved my problem too. Plus re-installing the app. I also find this issue. It's XCode 7.0.1 bug,I also fix it without use images.xcassets. The image can't show launchScreen.xib from images.xcassets. 1.you can copy the image to xcode project root path. 2.you must rename the image with the different name. Wait so long and nothing change ! Thank you. @buck. I just copied Image to xcode project root path. It was working fine now. I was just having the same problem on my iPhone 6s running iOS 9.1 with an app I'm working on. The solution for me was simply to make sure that the "Clears Graphics Context" box is unchecked for the UIImageView in the storyboard. Just changing this fixed it for me - I actually had another image in that same storyboard that had that box unchecked and it was already showing up. I noticed the same problem sometime after upgrading to iOS 9.2 on my iPhone 6 and XCode 7.2. Your solution worked for me. Thanks man, I didn't think about that, but indeed it fixed the issue! A StackOverflow answer by @jaga provides the solution, but not the reason, as to why UIImageViews are missing in the Launch Screen on device (but not in the simulator). Recently I attempted to use a custom font in my "Launch Screen.storyboard" file. The reason I could not became clear after reading this StackOverflow answer by @TimCamber, which prompted me to do a little more research and testing. 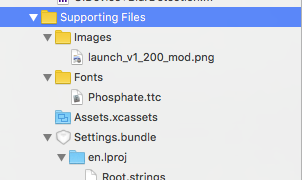 This process to prepare the launch screen is complete before any supporting files are loaded, including any custom fonts and the asset catalogue. reference that image in your UIImageView object in the Launch Screen Storyboard file. Example 1: Screenshot of Project Navigator in Xcode - image file added under the Supporting Files subdirectory in an Images subdirectory. Example 2: Screenshot of Attributes Inspector in Xcode - Image View section detailing reference to the image file used for a UIImageView. Sadly, this still doesn't fix the problem. I had hoped this might be the issue because I do use a custom font on my launch screen, but the proposed solution did not work. The only thing that works is changing the name image file in the LaunchScreen.storyboard file from myLaunchImage.png to myLaunchImage. When I do this, the launch image shows up again. But as soon as I make a modification to the Main.storyboard, the launch screen goes black again. When that happens, I go back to my LaunchScreen.storyboard file and then change the image name again. This time I switch it back to myLaunchImage.png. This is maddening. Why would removing the image file extension (or re-adding it) temporarily fix it? And why is a modification of Main.storyboard impacting the display of the launch image. @jeffb6688 custom fonts and the asset catalogue are not loaded into memory by iOS in time for the app to display these in the launch screen storyboard. This is why iOS prepares cached snapshots of the launch screen. The cached snapshots are used at launch, not the supporting assets. The workaround for images is as I described in my answer (in response to question by OP). The workaround for custom fonts is more complicated. Regardless of where they are placed in the file system, custom fonts are not loaded into memory by iOS in time for the app to display these in a launch screen storyboard. So the workaround... we must prepare static image files that contain the custom font as a part of (embedded into) that image, in a size and layout to suit each screen orientation, size and resolution. It won't take long to realise that this can become a significantly time consuming exercise given the great number of possibilities for screen orientation, size and resolution. We could complain about this but Apple makes it clear in their iOS Human Interface Guidelines that launch screen images are not intended to be traditional "splash screens". Design a launch screen that’s nearly identical to the first screen of your app. Avoid including text on your launch screen. Yes, Apple still approves apps with traditional splash screens, however this is contrary to their iOS HIG. I've been fighting this exact issue for a couple of days and taking the images used by my launch storyboard out of the asset catalog and making them simple files fixed the issue. It appears that asset catalogs are not reliably loaded in time to be used by launch storyboards. Additionally, I had to rename it (as I was trying to update an old version of it), or the old one would still show up until the device was restarted and the app reinstalled. One of the things I had done was rename an image used in the launch storyboard. "Gradient.png" became "Splash Gradient.png". I took the space out and it worked again! It seems that if your launch storyboard has a UIImageView with an image whose filename contains a space, the entire storyboard won't launch. Same is true for a launch XIB (which I tried). First, previous image shown long time. To get rid of it I deleted UIImage on launch screen re created a new one. Link with the name image; result : no image at all. This is not about alpha channel , I tested. Creating; New image name (I mean newlogo.png) and new asset in Xcode with different name. Then using it made work. I could see the new correct image. I had the same problem, but found out that it depended on where I put the image. The "Main" and "Launch" Storyboards were looking for an image in one Assets folder, while the app was looking for images in another. I put the images into the correct folder, and the problem was instantly solved!